Gold is gaining traction again as investors' confidence is vanishing. Major indices are in decline with the S&P witnessing the biggest single day loss since February and the DOW falling by more than 3% during yesterday's session. Rising global trade tensions are also giving back Gold its allure as a safe haven instrument as the U.S. Treasury Secretary Steven Mnuchin warned China about currency manipulation. Gold prices gathered some momentum after hitting new lows to climb back above the $1190 level. As of now the yellow metal has added more than $10 of gains hovering just below the $1,199 level. 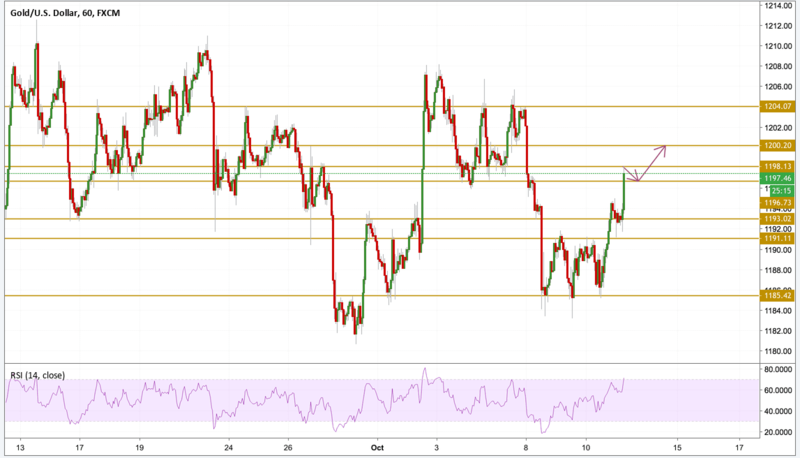 The RSI is pointing towards a slight overbought condition, however the yellow metal has more room to climb and this time we will be watching closely the $1,200 level with a potential to break above it.